Our European Adventure began in Munich, after a 12-hour overnight flight from Dallas with a short layover in Frankfurt. The details are a little fuzzy on how we made it to our hotel, but I do recall it involving our "German Phrase-book for Travelers", public transit, dogs being allowed on the trains and buses and that the German people we bumped into got a kick out of our attempts to speak their language. My friend, JoBeth had suggested we pre-book our room in Munich - good idea. We chose The Hotel Atlanta. Surprisingly - The Hotel Atlanta still exists! I think if we could have read German, The Hotel Atlanta's slogan would have been "Charm on a Budget". Nothing fancy - but it was in a killer location...just steps away from Marienplatz (St. Mary's Square) - Home of The Glockenspiel. Marienplatz is a central square located in the heart of Munich. The grand, gothic Glockenspiel chimes every day at 11 am with music and the appearance of life-sized figures that dance, joust and enact a play of sorts. It's really something to see. Thirty years ago, an estimated three-million people attended - current stats show it's closer to six million. All about beer, music, dancing and Bavarian culture. The brewery-sponsored pavilions rival one another in beverage,food and entertainment. Who knew it was the world's largest fair as well? The only hiccough we experienced in Munich was when I lost my wallet. It was the morning after an evening of chicken-dancing in the Hoffbrau Haus while (no doubt) inebriated that I realized my wallet to be missing. Money wasn't the issue. Back then, ATM's were non-existent and cash/travelers checks were thankfully, carried in a money belt. My Canadian passport had been handed over to my hotel upon check-in. It was the loss of my U.S. Resident Alien ID card (permitting my re-entry into the US) that got my attention. 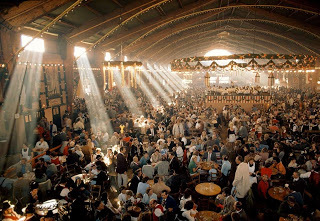 So, after a day of schlepping all over Munich, in search of the city's Lost and Found department, JoBeth and I eventually made it back to Oktoberfest. We checked with all the beer tents that we had visited the night before. No luck. Having exhausted all resources, we sat down and ordered a beer. It was then that I remembered St. Anthony. My Catholic mother was known for carrying a ready supply of religious medallions and swore by praying to St. Anthony whenever she lost something. So as JoBeth and I contemplated our next step of visiting the U.S. Consulate, a prayer to St. Anthony certainly wouldn't hurt. I bowed my head over my beer stein. A young man, seated behind me had apparently overheard our conversation and asked me if I lost something. His English wasn't great but it was a whole lot better than my German. With the use of my handy "German Phrasebook for Travelers" and pantomime, I told him the story of losing my wallet the night before. He nodded in understanding and motioned to me that he would return. Within minutes, he came back and motioned for me to come with him. He brought me to a woman at the ticket-stall of The Hoffbrau Haus. She smiled when she saw me because she recognized my face from my drivers license. With the exception of a small amount of cash, my wallet was returned to me intact. Side-note: My mother had given me a religious medal prior to my overseas trip. She told me to keep it in my in my wallet. I did as I was told. I had no idea what medal it was until I got my wallet back. The medal was "Marien".